Go Retro with these classic 1950's Diner Gifts. The 1950's diner is an iconic symbol of the decade that made Elvis famous.. Tall shakes, neon signs, the checkerboard floor and hanging with pals in a red and white booth are all memories from the 1950's diner. For those of us who grew up in the 1970's Happy Days relived the glorious 1950's diner with Mel's Diner. Here's a collection of retro 1950's diner gifts for friends and family who love 1950's nostalgia. 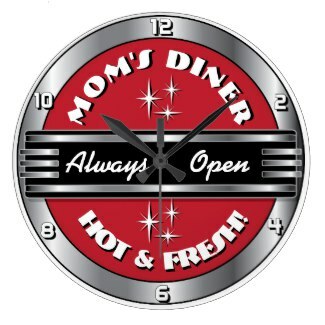 This red, silver and black Mom's Diner clock says Always open. Customize with your own retro message too. Learn more and order now. 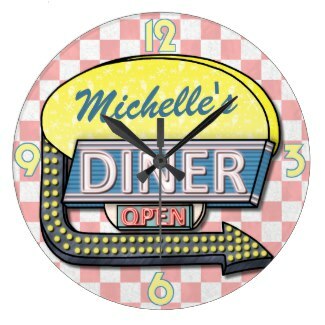 Customize this OPEN retro 1950's Diner clock with your favorite friends name. 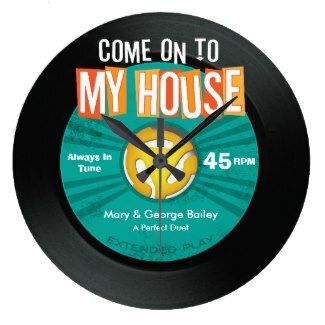 Rock around the diner clock with your favorites 45! Customize this vinyl record with your favorite 1950's song. Carry your groceries in a retro bag! These retro 1950's dinner tote bags are available in 5 sizes and are made of 100% natural material. 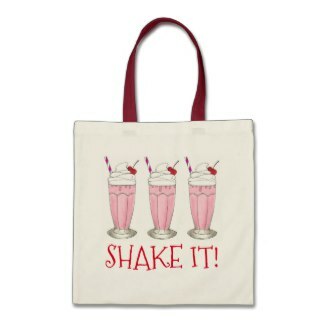 Go retro with this customizable 1950's diner tote bag with a classic milkshake design. 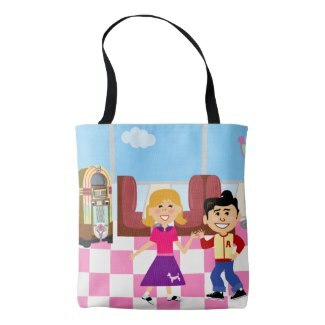 This Sock Hop Diner Love Tote Bag is adorable with a greasy guy and poodle skirt. Customize with a name. 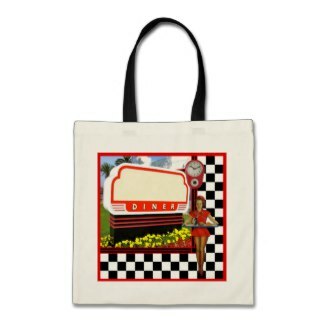 Customize this retro 1950's diner bag with a name or place. We just love the checkerboard pattern. Get your BFF a customized retro gift he or she won't forget. 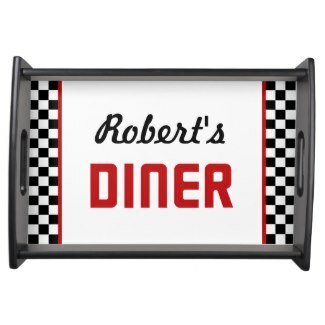 These Personalized Diner Serving Trays are 14.5" w x 10" l x 2.125" d and designs printed in full color on high quality hardboard panel with glossy finish. Customize this retro 1950's checkerboard diner tray with your friends name for a perfect personalized gift. This retro 1950's cartoon diner scene is whimsical and cute. Add a name for a personalized gift. Having a retro 1950's party? Check out our selection of 1950's Party Invitations.